Proanthocyanidins are among the most abundant constituents in pine bark extracts (PBEs). This review summarizes medical research on PBEs from Pinus pinaster, Pinus radiata, Pinus massoniana, and other less well characterized species. The precise mechanisms of the important physiologic functions of PBE components remain to be elucidated, but there is evidently great potential for the identification and development of novel antioxidant, anti-inflammatory, cardiovascular, neuroprotective, and anticancer medicines. Although toxicological data for PBEs are limited, no serious adverse effects have been reported. PBEs, therefore, may have potential as nutraceuticals and pharmaceuticals and should be safe for use as food ingredients. The bark, needles, and pollen of several species of pine tree have proven to be a useful source of natural products and have been used by humankind for many years. Proanthocyanidins are the main active components in pine bark extracts (PBEs) and are among the most abundant compounds in various pine species. The first use of PBEs dates back to 1535 when the French explorer Jacques Cartier and his crew escaped death by scurvy, a disease caused by a lack of vitamin C, by drinking tea made from the bark of a pine tree. This indicated that one of the active ingredients in PBEs may share a function with or enhance the function of vitamin C. Cartier’s writing inspired the researcher Jacques Masquelier to identify the active ingredients in PBEs, and he extracted an oligomeric proanthocyanidin from peanut skin as well as other proanthocyanidins, such as Pycnogenol (PYC; Horphag Research, Geneva, Switzerland), from the bark of the European coastal or French maritime pine Pinus pinaster (D’Andrea, 2010), which was later patented in the United States. PBEs were previously considered to be an inconvenient waste product in the timber industry but are now widely acknowledged as a rich source of natural polyphenols, with potential beneficial nutritional, health, and medicinal properties (Jerez et al., 2007). PYC, the most widely studied PBE, is now used as a nutritional supplement and phytochemical remedy for various diseases throughout the world, including chronic inflammation, circulatory dysfunction, and asthma (Packer et al., 1999). In addition to PYC, Pinus radiata (Monterey or Insignis pine) and Pinus massoniana bark extracts (PMBEs) have also aroused the interest of many researchers. P. radiata PBE (trade name is Enzogenol; ENZO Nutraceuticals, Paeroa, New Zealand) is extracted from 15–30-year-old trees and formulated with vitamin C. Enzogenol is rich in proanthocyanidins, is a richer source of procyanidins than PYC (Jerez et al., 2007), and has antioxidative, anti-inflammatory, anticancer, cardioprotective, and neuroprotective properties. P. massoniana lamb is native to the south and southwest of China, and its bark, needles, pollen, and turpentine have been used in traditional Chinese medicine for the treatment of hemorrhage, rheumatism, arthralgia, inflammation, and cancer (Cui et al., 2005b). The main bioactive constituents were identified and extracted during the last decade of the 20th century, and the principal ingredient of PMBE is also a procyanidin. PMBE inhibits the migration and growth of cancer cells and shows similar antioxidant and immunomodulatory properties to PYC and Enzogenol. In this review, we compiled the findings of recent experimental studies on PBEs from the French maritime pine, P. radiata, and PMBE. All extracts are abundant in proanthocyanidins, and their potential as a source of antioxidant, anti-inflammatory, antimutagenic, antimetastatic, and anticarcinogenic compounds, along with their cardioprotective and neuroprotective properties, was assessed. Methods for preparation of PBEs differ, but all include grinding, washing, and extracting with deionized hot water (95–99°C) for 30 minutes, removing extracted solids, cooling the raw liquor using a heat exchanger, and concentrating by reverse osmosis to approximately 25% to dissolve solids. Any undissolved solids are continually removed, and the sample is freeze dried, ground, and blended. Quality control is performed to assess purity. As mentioned previously, PBEs are rich in proanthocyanidins, and more diverse compounds are continually being discovered, such as taxifolin, catechin (Iravani and Zolfaghari, 2011), phenolic acids and stilbenes, protocatechuic acid, and carbohydrates (Frevel et al., 2012). However, the primary biologically active components of PYC are the nonconjugated procyanidins B1 [5-(3′,4′-dihydroxyphenyl)-g-valerolactone] and M1 [δ-(3,4-dihydroxy-phenyl)-γ-valerolactone] (formed in vivo from a catechin polymer by gut microbiota) (Jerez et al., 2007). Interestingly, PYC displays stronger biologic activity as a mixture than when separated into its individual components, indicating that the components interact synergistically (Yoshida et al., 2011). PBEs exhibit complex pharmacokinetics, and the existing literature is limited. As stated above, proanthocyanidins are the primary active constituents of PBEs, and studies on pharmacokinetics, discussed below, have mainly focused on proanthocyanidins. The so-called “rule of five” can be used to describe the physicochemical properties on which the oral bioavailability of molecules with drug-like properties depends (Lipinski et al., 2001). If a compound has less than five hydrogen bond donors, less than 10 hydrogen acceptors, a relative molecular weight below 500, or a log P smaller than five, it is likely to be readily absorbed. All monomeric polyphenols detected in plasmas in the studies discussed in this review comply with this designation (Grimm et al., 2006). The absorption of proanthocyanidins through the gut barrier is likely to be limited by their polymeric nature and high molecular weight (Fernandes et al., 2012). Lower-molecular-weight components and metabolites are more easily absorbed (Fernandes et al., 2012; Kosińska and Andlauer, 2012). Most in vivo studies suggest that procyanidin dimers can be absorbed (Baba et al., 2002; Tsang et al., 2005; Shoji et al., 2006; Prasain et al., 2009). The gut is the predominant location for absorption, a large percentage of the parent compound may be transformed by gut microflora, and the resulting metabolites may constitute the predominant form of absorption (Stoupi et al., 2010). More than seven different constituents or metabolites were detected in plasma following oral administration of Pycnogenol, and five (catechin, caffeic acid, ferulic acid, taxifolin, and M1) were derived directly from Pycnogenol. Maximum concentrations (Cmax) were as follows: catechin = 107 ng/ml; caffeic acid = 17 ng/ml; ferulic acid = 15 ng/ml; taxifolin = 33 ng/ml; and the metabolite M1 = 4 ng/ml. The analysis of steady-state plasma samples showed that compounds were present as conjugates of sulfate and/or glucuronic acid, indicating phase II metabolism in the liver (Grimm et al., 2006). Proanthocyanidins undergo structural modifications during phase II metabolism that may affect protein-binding properties and tissue distribution (Fernández-Murga et al., 2011). With procyanidin-rich simple food matrices, the highest metabolite accumulation was observed in the liver, and methyl catechin–glucuronide was the only procyanidin phase II metabolite detected in this organ (Serra et al., 2013). For procyanidin-rich complex food matrices, the kidney was the major site of metabolite accumulation (Serra et al., 2013), and glucuronidated and methylated forms of epicatechin and catechin were the predominant phase II procyanidin metabolites detected in this organ (Baba et al., 2002; Natsume et al., 2003; Tsang et al., 2005). All major procyanidin metabolites detected in plasma were present in lung tissue, which contained the highest concentrations of glucuronide and methyl glucuronide epicatechin metabolites (Serra et al., 2013). No phase II procyanidin metabolites were identified in the heart with procyanidin-rich simple or complex food matrices. However, after ingestion of a procyanidin-rich complex food matrix, three phenolic acid compounds were detected in heart tissue, with phenylacetic acid predominating. Increased phenolic acids were also observed in the thymus, testicles, and spleen (Serra et al., 2013), although the increase was only slight for vanillic acid (Serra et al., 2013). After intravenous administration of procyanidin B2, 76% was excreted in the urine, reflecting extensive renal clearance (Stoupi et al., 2010). Several procyanidin metabolites were present in the kidney, which further indicated that urine was the main procyanidin excretion pathway in the rat (Serra et al., 2011). Düweler and Rohdewald (2000) identified two further metabolites of PYC in the urine of human volunteers. In male rats, extensive enterohepatic cycling of flavonoids and their conjugated metabolites has been reported (Coldham and Sauer, 2000; Silberberg et al., 2006), and 28% of intravenously administered procyanidin B2 was excreted in feces, which is consistent with biliary excretion and enterohepatic recycling (Stoupi et al., 2010). Free radicals are strong oxidizing agents that cause considerable damage to proteins, lipids, and DNA, which leads to chronic cardiovascular, cerebral, and metabolic diseases as well as senescence. Oxidative stress occurs when free radical levels exceed the cellular antioxidant capacity (Flohé et al., 1997). PYC, Enzogenol, and PMBE are rich in proanthocyanidins, which are strong quenchers of reactive oxygen species (ROS) and hence potent antioxidants (Afaq and Mukhtar, 2006). These extracts differ in their exact physiologic effects, as discussed below. PYC and Enzogenol protect biomacromolecules from oxidative stress. Specifically, PYC inhibits lipid peroxidation, regenerates the ascorbyl radical, and further protects endogenous vitamin E and glutathione from oxidative damage (Grimm et al., 2004). Additional protective effects arise from their ability to inhibit the generation of thiobarbituric acid reactive products, and oxidative hemolysis by hydrogen peroxide (D’Andrea, 2010). For defense against photoaging and UV damage, an oral antioxidant treatment would be a highly desirable option. Orally administered vitamins or botanical polyphenols demonstrated UV-protective properties in the skin (Stahl and Sies, 2007), and PYC can help to reduce UV skin damage and may protect against photoaging. A significant reduction in age pigment was demonstrated using skin color measurements, and clinical trials demonstrated that PYC protects skin from UV damage (Furumura et al., 2012). The efficacy and safety of these treatments have been validated. Aside from directly protecting against UV, PYC has been shown to prevent ROS-induced skin damage (Yoshida et al., 2011). Research on hairless mice showed that PYC has the ability to reduce ROS-mediated oxidative stress in the maxillofacial region circulation due to its ROS scavenging activity. This indicates that PYC may be useful as a prophylactic antioxidant for the prevention of ROS-induced skin diseases. Furthermore, PYC is also effective in preventing potassium dichromate–induced oxidation-mediated nephrotoxicity, but additional studies are needed to explore the potential of PYC as a nephroprotective agent (Parveen et al., 2009). Enzogenol has marked superoxide radical scavenging activity in vitro and is a more effective antioxidant than vitamin C, trolox, catechin, and grape seed extracts (Wood et al., 2002). Enzogenol in combination with vitamin C can significantly reduce the oxidation of proteins and DNA (Senthilmohan et al., 2003), and a clinical trial of this combination successfully reduced systemic plasma protein oxidation to significantly lower levels than vitamin C alone (Young et al., 2006). Recent studies suggested that the antioxidant properties of PMBEs may be associated with the effects on antioxidant enzymes. PMBE protects normal human liver L-02 cells from hydrogen peroxide–induced damage. Malondialdehyde (MDA) is an indicator of lipid peroxidation, and levels of glutathione peroxidase, glutathione (GSH), catalase (CAT), and superoxide dismutase (SOD) reflect the degree of cell oxidative damage. Hydrogen peroxide directly causes permanent damage to cells and also increases MDA and decreases GSH and CAT. PMBE treatment decreases MDA, increases GSH, CAT, glutathione peroxidase, and SOD, and alleviates damage induced by carbon tetrachloride (Wang et al., 2010). Despite the different physiologic properties of the various bark extracts, they are likely to exert their effects via similar molecular mechanisms. Park et al. (2011) evaluated the immunomodulatory effects of proanthocyanidin-rich P. radiata extracts (PAEs) in specific pathogen-free white leghorn chickens. PAEs enhanced the proliferation of immune cells, such as peripheral blood mononuclear cells, splenocytes, and bursal cells. PAEs also induced production of the Th1 cytokine inteferon-γ, suppressed the production of the Th2 cytokine interleukin (IL)-6, and increased IL-18 mRNA (Park et al., 2011). Other researchers have reported on the anti-inflammatory properties of PAEs (Torras et al., 2005). PYC possesses anti-inflammatory properties and inhibits antidinitrophenyl (DNP) IgE–mediated passive cutaneous anaphylaxis in rats when administered orally. In vitro, PYC reduces histamine release from rat peritoneal mast cells triggered by anti-DNP IgE in a dose-dependent manner and inhibits protein expression and secretion of tumor necrosis factor-α and IL-6. Moreover, PYC decreases anti-DNP IgE–induced calcium uptake in rat peritoneal mast cells and suppresses the activation of nuclear factor-κB (Choi and Yan, 2009), a transcription factor controlling the expression of genes involved in inflammation. Together, these results have inspired the clinical use of PYC in mast cell–mediated immediate-type allergic diseases. PYC treatment simultaneously downregulates cyclooxygenase (COX)-2 and 5-lipoxygenase gene expression and reduces leukotriene biosynthesis in human polymorphonuclear leukocytes upon proinflammatory stimulation ex vivo (Choi and Yan, 2009). Furthermore, phospholipase A2 activity is also inhibited. Downregulation of COX-2 is partially compensated by upregulation of COX-1. Downregulation of 5-lipoxygenase consequently decreases leukotriene levels in asthmatic patients (Canali et al., 2009), and the anti-inflammatory activity of PYC may be best used in combination with inhalation corticosteroids, enabling reduced dosage and frequency of inhalation corticosteroid administration and potentially reducing the need for other asthma medications (Belcaro et al., 2011). Anti-inflammatory properties include alleviating pain and stiffness in arthritis and osteoarthritis patients (Belcaro et al., 2008a), and PYC is a promising antiarthritic drug candidate. PMBE can be used to treat autoimmune diseases since it can block inflammation while normal human horn (HaCaT) cells remain unaffected during short treatment periods. For example, when the action time is less than 12 hours, PMBE has little effect on HaCaT cells at all concentrations of PMBE tested. However, during a prolonged action time, PMBE can induce apoptosis in a dose-dependent manner. PMBE does not induce cell-cycle arrest in HaCaT cells since the number of surviving cells in every phase decreased after treatment. PMBE is therefore alleged to involve fewer side reactions if the action time is carefully controlled (Wu et al., 2008). In conclusion, PBEs have strong anti-inflammatory properties and immunomodulatory effects and are promising candidates for treating type I allergies, asthma, and arthritis. Although a number of animal trials have been reported, more clinical trials are needed. PBEs also possess anti-infection properties. Epstein-Barr virus (EBV) is associated with numerous diseases, including nasopharyngeal carcinoma, and this pathogen undergoes two distinct life cycle stages: the lytic cycle and the lytic productive cycle (Xu et al., 2012). The EBV immediate early genes Zta and Rta have an important function in the lytic cycle, and EA-D expression is also involved. PMBE inhibits the expression of Zta and Rta, which results in the failure to transcribe the EA-D gene. PMBE also inhibits transfection of plasmid pRluc (BRLF1 promoter) and pZluc (BZLF1 promoter), suggesting PMBE simultaneously inhibits transcription of immediate early genes and the lytic cycle. PMBE acts on EBV in a dose-dependent manner, and inhibiting EBV entry into the lytic cycle requires a low concentration, while completely blocking entry needs a higher concentration (Xu et al., 2012). PYC inhibits the binding of human immunodeficiency virus type-1 (HIV-1) to host cells and also inhibits viral replication and T-cell interaction in cell culture experiments (Feng et al., 2008). This activity may be due to upregulation of the intracellular antioxidant protein Mn-SOD and/or inhibition of phosphorylation of the ribosomal S6 protein. Additionally, the ectopic expression of Mn-SOD also inhibits HIV-1 replication, providing another route by which PYC acts as an anti–HIV-1 agent (Feng et al., 2008). PYC also inhibits the growth of Helicobacter pylori, albeit to a limited extent, and also perturbs their adherence to gastric cells (Rohdewald and Beil, 2008). Enzogenol has also been shown to be an effective antibacterial and antiviral agent. Proanthocyanidins may regulate carcinogenesis and the development and migration of tumors and also possess antimutation properties (Senthilmohan et al., 2003). The anticancer activity of PMBE has received the most attention. PMBE induces apoptosis in human cervical cancer HeLa cells, human hepatoma HepG2 cells (Ma et al., 2010), and murine sarcoma S180 cells (Zhang et al., 2012) in a dose-dependent manner, but has very little apoptosis-inducing activity in normal cells (Ma et al., 2010), making PMBE a potential anticancer therapeutic lead. 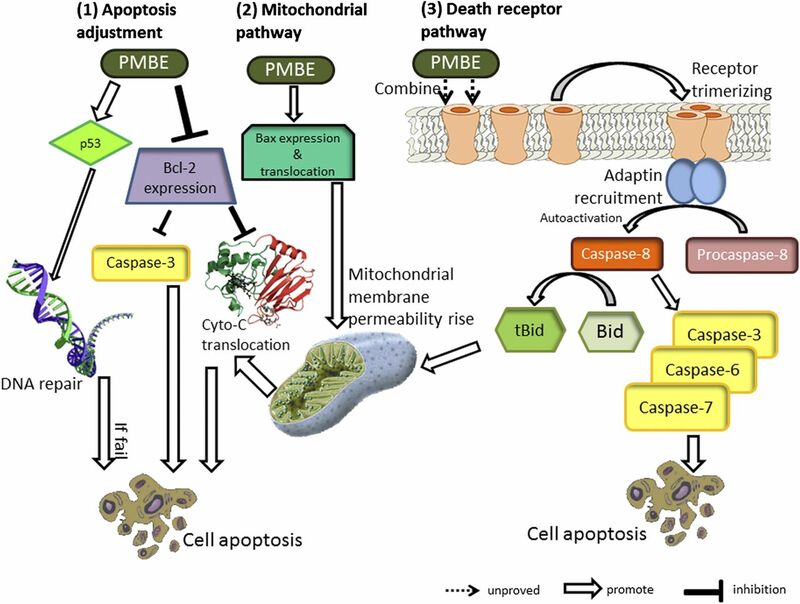 PMBE induces apoptosis via the death receptor and mitochondrial pathways (Fig. 1). It is not known whether PMBE acts via the endoplasmic reticulum pathway. PMBE treatment upregulates Bax expression in HeLa cells but not in HepG2 cells (Ma et al., 2010), and further studies are needed to understand the mechanisms involved. Mechanism of PMBE induction of apoptosis in cancer cells. PMBE induces apoptosis via two pathways: the death receptor and the mitochondrial pathways. In the death receptor pathway, PMBE binds to and stabilizes the trimerization of the death receptor, leading to procaspase-8 autoactivation (it is not known whether PMBE interacts with the death receptor directly). Caspase-8 promotes proapoptosis factor Bid truncation into tBid and activates caspases-3, -6, and -7. In the mitochondrial pathway, PMBE increases the expression of the proapoptotic protein Bax and decreases the expression of the antiapoptotic protein Bcl-2. This results in the translocation of cytochrome c from the mitochondria to the cytoplasm, further leading to apoptosis. In addition, PMBE also facilitates cell apoptosis and increases the expression of p53, which promotes DNA damage repair. If repair is successful, cells can recover and avoid apoptosis. Bid, BH3-interacting domain death agonist; tBid, truncated Bid. PMBE treatment affects cell-cycle distribution in four types of human cancer cells. It induces cell-cycle arrest at S and G2/M in a dose-dependent manner, and increased treatment time increased the proportion of HeLa cells in G2/M, but the opposite was true in HepG2 cells (Ma et al., 2010). PMBE also arrests the cell cycle of BEL-7402 (Cui et al., 2005a) and LoVo cells (Cui et al., 2007) at the G1 and S phase, respectively, resulting in apoptosis. These properties are also dose and time dependent, and tissue specificity may explain the different effects on different cell types. Inhibition of HeLa Cell Migration. PMBE has no significant effect on the adhesion capability of HeLa cells. However, the scratch migration assay indicated a strong inhibition of the migration capability of HeLa cells, and the molecular mechanism awaits further investigation (Wu et al., 2011). PMBE also induces peripheral leukocyte and lymphocyte proliferation and may inhibit the growth of cancer cells via activation of the immune system (Zhang et al., 2012). In experiments on tumor-bearing mice, PMBE (at a concentration above 200 mg/kg) raises the thymus index and spleen index, which reflects the immunologic function of mice (Zheng et al., 2007). Reduction of the Side Effects of Radiotherapy and Chemotherapy. The ability of PYC to markedly reduce side effects in patients receiving radiotherapy and chemotherapy has received widespread attention. A semiquantitative evaluation showed that symptom severity was less than half that of control groups. Furthermore, symptoms such as cognitive impairment, cardiotoxicity, and neutropenia were improved. The most apparent improvements in the acute side effects in radiotherapy patients were decreased soreness and ulceration in the mouth and throat and mitigation of dryness in the mouth and eyes. For chemotherapy patients, nausea, vomiting, diarrhea, and weight loss were all alleviated. PYC also effectively reduces the side effects of drugs through its endothelial protective, anti-inflammatory, and antiedema activities (Belcaro et al., 2008b). Enzogenol shares similar physiologic properties with PMBE, and studies on the potential anticancer effects of Enzogenol are few. ROS scavenging and protecting DNA from damage by peroxides are possible mechanisms underlying the anticancer properties of PBE. Finally, PYC appears to protect skin against squamous cell carcinomas (Pavlou et al., 2009), but the mechanisms are unknown at present. Proanthocyanidins are flavonoids that are known to relax vascular smooth muscle to help tissues absorb nutrients and excrete metabolites. PYC can noticeably reduce many of the risk factors associated with cardiovascular disease (CVD), such as systolic blood pressure, glycosylated hemoglobin, hyperlipidemia, and platelet aggregation (Parveen et al., 2009). PYC also improves endothelial function in patients with coronary artery disease by reducing oxidative stress (Enseleit et al., 2012). Enzogenol has been shown to block early atherogenesis and may therefore be useful for treating atherosclerosis (Kim et al., 2010). In combination with vitamin C, Enzogenol shows potential benefits for endothelial function, systolic blood pressure maintenance, plasma protein carbonyl balance, and leukocyte DNA protection (Abd El Mohsen et al., 2002; Young et al., 2006). Hypertension is an important factor of CVD that has received considerable attention, and treatments for hypertension have been developed (Fitzpatrick et al., 1998). PYC possesses a potent endothelium-dependent vasorelaxant activity on rat aortic rings in vitro, and vasorelaxation is suppressed by pretreatment with a nonselective nitric oxide (NO) synthase (NOS) inhibitor (Fitzpatrick et al., 1998), suggesting that PYC-induced endothelium-dependent vasorelaxation is associated with NOS. Indeed, a report in 2009 demonstrated that PYC-induced endothelium-dependent vasorelaxation was mediated by the endothelial NOS-NO–soluble guanylate cyclase signaling system (Kwak et al., 2009). Other studies involving hypertensive patients showed that dietary PYC supplementation decreases plasma endothelin-1 concentrations, whereas NO metabolite levels in plasma tend to increase, suggesting PYC has beneficial effects on endothelial function in hypertensive patients (Liu et al., 2004). The antihypertensive effects of PYC are therefore attributed to both antioxidant-mediated protective effects against endothelial dysfunction and endothelium-dependent vasorelaxation mediated by endothelial NOS activation (Kwak et al., 2009). Additionally, at levels of 100 mg/day, PYC reduced the dosage of the calcium channel blocker nifedipine, which is required to maintain normal blood pressure levels (Liu et al., 2004). Patients with type 2 diabetes mellitus are at considerable risk of excessive morbidity and mortality from CVD (Parveen et al., 2010). PYC exhibits antidiabetic effects in a type 2 diabetes mellitus rat model by stimulating the antioxidant defense system (Zibadi et al., 2008). Other research showed that PYC improves diabetes control, lowers CVD risk factors, and reduces the required dosage of antihypertensive medicines (Parveen et al., 2010). Research on a type 1 diabetes model involving PYC administered alone or in combination with an antiplatelet therapy showed that PYC lowers platelet hyperactivity and exerts antithrombotic effects. However, the antithrombotic effects of long-term PYC treatment in diabetes patients is associated with enhanced thromboxane synthesis, which may lead to severe vascular complications (Nocun et al., 2008). PYC has also been shown to be useful for treating and controlling chronic venous insufficiency, and may be combined with compression stockings to good effect. Combined PYC and compression decreased ankle swelling, resting flux, transcutaneous oxygen pressure, and other clinical symptoms (Cesarone et al., 2010). Clinical studies have shown that PYC can reduce leg edema in chronic venous insufficiency, reduce the incidence of deep vein thrombosis during long-haul flights, and enhance the healing of venous ulcers and hemorrhoidal episodes by topical application and/or oral administration (Gulati, 2014). Although PYC is essentially a dietary supplement and not a replacement for pharmaceutical treatments, it is cost effective and efficient at negating many of the risks associated with CVD, especially when applied in early heart disease patients prior to drug therapy. Additive or substitutive use of PYC may help to reduce the dosage and cost of existing treatments and may improve their effectiveness (Chowdhury et al., 2011). Free radicals may be involved in the pathogenesis of particular brain disorders. In an aging brain, oxidative damage can be observed, and antioxidants may protect the brain from ROS damage. In one study, PBE in combination with vitamin C showed potential as a migraine treatment (Chayasirisobhon, 2013). Enzogenol displays a positive influence on cognitive performance, specifically on working memory, a type of short-term memory. In combination with vitamin C, Enzogenol improved the response speed of spatial working memory and immediate recognition tasks (Pipingas et al., 2008). In patients with 3–12 months post–mild traumatic brain injury, self-perceived cognitive failures were reduced (Theadom et al., 2013). Similarly, PYC prevents the accumulation of oxidatively damaged proteins and protects nerve cells against β-amyloid in a glutamate-induced toxicity model (Gulati, 2005), suggesting it may reduce the risks of neurodegenerative diseases, such as Parkinson’s, Alzheimer’s, and Huntington’s disease (Voss et al., 2006). The positive effects of Enzogenol on cognitive performance may operate through antioxidant action, improvements of cerebral blood supply and circulation, influences on neuronal signal transduction, and modification of cell contents following neurologic signaling (Abd El Mohsen et al., 2002). The brain is incredibly complex, and the exact mechanisms of neuroprotection are yet to be determined, but PBEs show promise as potential drugs for treating neurodegenerative diseases. Menopausal women receiving a low daily dose of PYC for a month showed significant improvement in the symptoms of menopausal syndrome, especially vasomotor and insomnia/sleep problems (Kohama and Negami, 2013). These results indicated that PYC is particularly correlated with climacteric symptoms. However, a placebo also had a degree of effect, which is a reminder of the importance of psychologic factors (Kohama and Negami, 2013). Suppression of Excessive Lipid Accumulation. Fatty liver formation is markedly reduced in mice with adipose differentiation–related protein (ADRP) expression abrogated by gene knockout or antisense oligonucleotides (Imai et al., 2007). ADRP abrogation also prevents atherosclerosis development (Paul et al., 2008) and diet-induced insulin resistance (Varela et al., 2008). These findings strongly implicate ADRP as a promising target for preventing excessive lipid accumulation, which can induce the production of oleic acid if intracellular. PYC has been shown to reduce oleic acid–induced ADRP expression and suppress the formation of lipid droplets (Fan et al., 2009). Fan et al. (2009) demonstrated that PYC achieved these effects by enhancing ADRP mRNA degradation. The intracellular lipid accumulation suppressing activity of PYC indicates a potential use in treating fatty liver disease (Fan et al., 2009). Lipopolysaccharide upregulates ADRP transcription by first inducing the expression of IL-6, IL-1α, and interferon-β that subsequently stimulate ADRP expression (Gu et al., 2008). PYC suppresses the expression of ADRP and the aforementioned cytokines and may therefore be useful for the prevention of atherosclerosis. Extracts from numerous other types of pine trees have been shown to have beneficial effects, and bark extracts are a particularly rich source of physiologically and potentially pharmacologically active compounds (Table 1). Other pine bark extracts have important biologic activities and, like Pycnogenol, Enzogenol, and PMBE, are also rich in flavonoids and may function as ROS scavengers and have anticancer properties. PBE is generally regarded as safe by independent toxicology experts based on the results of 70 clinical trials that include healthy subjects and patients with particular disease histories (n = 5723). The frequency rate of adverse effects, which include gastrointestinal discomfort, dizziness, headache, and nausea, is 2.4 and 0.19% in patients and healthy subjects, respectively. No alarming side effects, even at high dosages, have been reported to date. Therefore, PBE at a dosage of 20–100 mg/day for long periods (months) and 100–300 mg for shorter periods are considered nontoxic (Heather, 2010). With Enzogenol, adverse events, including emesis and diarrhea, occurred in unfed dogs given the highest doses (Frevel et al., 2012); however, in human trials, no safety issues have arisen (Drieling et al., 2010; Frevel et al., 2012; Theadom et al., 2013). Enzogenol, derived from the bark of P. radiata, is a commercially available proanthocyanidin-rich flavonoid extract used widely in functional foods. Its recommended dosage ranges from 480–960 mg/day, and treatment durations have ranged from 5 weeks to 6 months in human clinical trials. A typical study on protein oxidation and DNA damage in older human subjects involved a dosage of 480 mg/day and treatment duration of 12 weeks (Senthilmohan et al., 2003). Pycnogenol is another common functional food ingredient that has been used for a long time. A typical dosage of 150 mg/day for 6 months can improve health risk factors in subjects with metabolic syndrome and may also be effective in changing some behavioral patterns that contribute to persistent undesirable traits in patients with metabolic syndrome (Belcaro et al., 2013). Mood and attention changed favorably upon Pycnogenol treatment in a study involving student volunteers (Luzzi et al., 2011). Based on data from recent reports and given the safe dosage range discussed above, we speculate that a dosage from 100 to 200 mg/day could be safely recommended. Most reports on PMBE have focused on the cellular level, and clinical data for recommending appropriate dosage are lacking. Functional foods containing PMBE are relatively few in number, but SongZhen capsules (Zhongjianxing Group Co., Lechang, China) contain >5 g/100 g of procyanidins and 400–600 mg of flavone. To date, PYC has received more attention than other PBEs, and many beneficial effects have been reported (as discussed above). PYC is already commercially available as an herbal dietary supplement that may be taken to ameliorate various degenerative disorders (Rohdewald, 2002) and is a promising candidate for treating endothelial dysfunction and as a prophylactic for protecting against vascular diseases (Gulati, 2005). PYC also has beneficial effects on chronic disorders, but further investigations are required before it can be recommended for this use (Sivonová et al., 2004). As a dietary supplement or health care product, PYC decreases the risk of many common diseases and/or reduces the required dosage of many conventional drugs. However, for more extensive pharmaceutical use of PYC, full clinical trials would be needed. The biologically active components of PYC are polyphenolic compounds and other PBEs containing high levels of polyphenolics that are potential alternatives to PYC in dietary supplements, pharmaceuticals, cosmetic products, and foods/beverages (Iravani and Zolfaghari, 2011). PBEs have undergone numerous animal experiments and clinical trials, and almost all reports found them to be safe and well tolerated with few side effects. Frevel et al. (2012) found that Enzogenol exhibited no adverse effects on liver or kidney function in animals and humans (Frevel et al., 2012), confirming the safety of this extract as a food supplement. PMBE reportedly inhibits HeLa cell migration, but the underlying mechanism is currently unknown (Wu et al., 2011). Although PMBE has not been thoroughly investigated, it is a potential chemotherapy drug that can effectively inhibit the growth of cancer cells and protect normal cells. Chemotherapeutic agents with fewer side effects are highly desirable. The time- and dose-dependent action of PMBE results in a failure to completely kill cancer cells; therefore, PMBE must be used in combination with other chemotherapies. The mechanism of the actions of PMBE on cancer cells has not been completely elucidated, and studying this mechanism may reveal valuable information on the potential uses of traditional Chinese medicines in combination with modern Western medicines for chemotherapy. In summary, PBEs are rich in proanthocyanidins, and include Pycnogenol, Enzogenol, and PMBE. These extracts have been widely tested in animal and clinical studies as dietary supplements due to their potent antioxidant, anti-inflammatory, anticancer, cardioprotective, and neuroprotective activities. They are safe and exhibit few undesirable side effects. Following suitable clinical trials, PBEs may be used in functional foods or pharmaceuticals to treat numerous diseases. The efficacy of PBEs may be improved by the addition of supplementary ingredients, determining optimum dosage, or changing the administration route. Finally, the molecular mechanisms of the various biologic activities of PBEs are yet to be determined and should be studied if the true medicinal potential of these extracts is to be realized. The authors thank the staff of the Key Laboratory of Arrhythmias, Ministry of Education (Tongji University), for technical assistance. The authors also thank the reviewers for comments and suggestions that improved this review considerably. Participated in research design: Cui, Li, Feng, Zhang. Wrote or contributed to the writing of the manuscript: Cui, Li, Feng, Zhang. This study was supported by the National University Students Innovation Training Program [Grant 1500107070 (to Y.-Y.L. )]; and the Yangfan Project of the Tongji University School of Medicine [Grant 2012YF05 (to Y.-Y.C.)]. The authors declare no conflicts of interest. (2002) Uptake and metabolism of epicatechin and its access to the brain after oral ingestion. Free Radic Biol Med 33:1693–1702. (2006) Botanical antioxidants in the prevention of photocarcinogenesis and photoaging. Exp Dermatol 15:678–684. (2011) Chemical, antioxidant and antimicrobial investigations of Pinus cembra L. bark and needles. Molecules 16:7773–7788. (2002) Absorption and urinary excretion of procyanidin B2 [epicatechin-(4β-8)-epicatechin] in rats. Free Radic Biol Med 33:142–148. (2008a) Treatment of osteoarthritis with Pycnogenol. The SVOS (San Valentino Osteo-arthrosis Study). Evaluation of signs, symptoms, physical performance and vascular aspects. Phytother Res 22:518–523. (2008b) Pycnogenol may alleviate adverse effects in oncologic treatment. Panminerva Med 50:227–234. (2013) Pycnogenol® supplementation improves health risk factors in subjects with metabolic syndrome. Phytother Res 27:1572–1578. (2011) Pycnogenol® improvements in asthma management. Panminerva Med 53 (Suppl 1):57–64. (2009) The anti-inflammatory pharmacology of Pycnogenol in humans involves COX-2 and 5-LOX mRNA expression in leukocytes. Int Immunopharmacol 9:1145–1149. (2010) Improvement of signs and symptoms of chronic venous insufficiency and microangiopathy with Pycnogenol: a prospective, controlled study. Phytomedicine 17:835–839. (2013) Efficacy of Pinus radiata bark extract and vitamin C combination product as a prophylactic therapy for recalcitrant migraine and long-term results. Acta Neurol Taiwan 22:13–21. (2009) Pycnogenol inhibits immunoglobulin E-mediated allergic response in mast cells. Phytother Res 23:1691–1695. (2011) Pycnogenol supplementation and cardiovascular health: treatment and cost-benefit analysis, in Nutrients, Dietary Supplements, and Nutriceuticals: Cost Analysis Versus Clinical Benefits (Watson RR, Gerald JK, and Preedy VR eds) pp 467–475, Humana Press, London. (2000) Pharmacokinetics of [(14)C]Genistein in the rat: gender-related differences, potential mechanisms of biological action, and implications for human health. Toxicol Appl Pharmacol 164:206–215. (2007) Primary exploration of mechanism of Pinus massoniana bark extract inhibiting growth of human colorectal carcinoma cells in vitro (Chinese). J China Agric Univ 12:7–14. (2005a) Effects of Pinus massoniana bark extract on cell proliferation and apoptosis of human hepatoma BEL-7402 cells. World J Gastroenterol 11:5277–5282. (2005b) Potential biomedical properties of Pinus massoniana bark extract. Phytother Res 19:34–38. (2010) Pycnogenol: a blend of procyanidins with multifaceted therapeutic applications? Fitoterapia 81:724–736. (2010) No beneficial effects of pine bark extract on cardiovascular disease risk factors. Arch Intern Med 170:1541–1547. (2008) Anticoagulant activity of arabinogalactane sulfate and cedar bark extract studied in vitro. Eksp Klin Farmakol 71:30–34. (2000) Urinary metabolites of French maritime pine bark extract in humans. Pharmazie 55:364–368. (2012) Effects of Pycnogenol on endothelial function in patients with stable coronary artery disease: a double-blind, randomized, placebo-controlled, cross-over study. Eur Heart J 33:1589–1597. (2009) Oleic acid-induced ADRP expression requires both AP-1 and PPAR response elements, and is reduced by Pycnogenol through mRNA degradation in NMuLi liver cells. Am J Physiol Endocrinol Metab 297:E112–E123. (2008) Pycnogenol, a procyanidin-rich extract from French maritime pine, inhibits intracellular replication of HIV-1 as well as its binding to host cells. Jpn J Infect Dis 61:279–285. (2012) On the bioavailability of flavanols and anthocyanins: flavanol-anthocyanin dimers. Food Chem 135:812–818. (2011) The impact of chocolate on cardiovascular health. Maturitas 69:312–321. (1998) Endothelium-dependent vascular effects of Pycnogenol. J Cardiovasc Pharmacol 32:509–515. (1997) Redox regulation of NF-kappa B activation. Free Radic Biol Med 22:1115–1126. (2012) Production, composition and toxicology studies of Enzogenol® Pinus radiata bark extract. Food Chem Toxicol 50:4316–4324. (2006) Tannins from barks of Pinus caribaea protect Escherichia coli cells against DNA damage induced by γ-rays. Fitoterapia 77:116–120. (2012) Oral administration of French maritime pine bark extract (Flavangenol(®)) improves clinical symptoms in photoaged facial skin. Clin Interv Aging 7:275–286. (2004) Antioxidant activity and inhibition of matrix metalloproteinases by metabolites of maritime pine bark extract (pycnogenol). Free Radic Biol Med 36:811–822. (2006) Single and multiple dose pharmacokinetics of maritime pine bark extract (pycnogenol) after oral administration to healthy volunteers. BMC Clin Pharmacol 6:4. (2008) Pycnogenol, an extract from French maritime pine, suppresses Toll-like receptor 4-mediated expression of adipose differentiation-related protein in macrophages. Am J Physiol Endocrinol Metab 295:E1390–E1400. (2005) The nutraceutical Pycnogenol: its role in cardiovascular health and blood glucose control. Biomed Rev 16:49–57. (2014) Pycnogenol® in chronic venous insufficiency and related venous disorders. Phytother Res 28:348–362. Heather O (2010) Scientific and Clinical Monograph for PYCNOGENOL, American Botanical Council, Austin, TX. (2005) Anti-oxidant activity and effect of Pinus morrisonicola Hay. on the survival of leukemia cell line U937. Phytomedicine 12:663–669. (2007) Reduction of hepatosteatosis and lipid levels by an adipose differentiation-related protein antisense oligonucleotide. Gastroenterology 132:1947–1954. (2009) Effects of Pinus brutia bark extract and Pycnogenol in a rat model of carrageenan induced inflammation. Phytomedicine 16:1101–1104. (2011) Pharmaceutical and nutraceutical effects of Pinus pinaster bark extract. Res Pharm Sci 6:1–11. (2007) A comparison between bark extracts from Pinus pinaster and Pinus radiata: antioxidant activity and procyanidin composition. Food Chem 100:439–444. (2012a) Analgesic and anti-inflammatory activity of Pinus roxburghii Sarg. Adv Pharmacol Sci 2012:245431. (2012b) Anticonvulsant activity of alcoholic extract of bark of Pinus roxburghii Sarg. Zhong Xi Yi Jie He Xue Bao 10:1056–1060. (2010) Pine bark extract enzogenol attenuated tumor necrosis factor-α-induced endothelial cell adhesion and monocyte transmigration. J Agric Food Chem 58:7088–7095. (2013) Effect of low-dose French maritime pine bark extract on climacteric syndrome in 170 perimenopausal women: a randomized, double-blind, placebo-controlled trial. J Reprod Med 58:39–46. (2012) Cocoa polyphenols are absorbed in Caco-2 cell model of intestinal epithelium. Food Chem 135:999–1005. (2009) Antihypertensive effect of French maritime pine bark extract (Flavangenol): possible involvement of endothelial nitric oxide-dependent vasorelaxation. J Hypertens 27:92–101. (2007) Antitumor activity of the procyanidins from Pinus koraiensis bark on mice bearing U14 cervical cancer. Yakugaku Zasshi 127:1145–1151. (2001) Experimental and computational approaches to estimate solubility and permeability in drug discovery and development settings. Adv Drug Deliv Rev 46:3–26. (2004) Pycnogenol, French maritime pine bark extract, improves endothelial function of hypertensive patients. Life Sci 74:855–862. (2011) Pycnogenol® supplementation improves cognitive function, attention and mental performance in students. Panminerva Med 53 (Suppl 1):75–82. (2010) Pinus massoniana bark extract selectively induces apoptosis in human hepatoma cells, possibly through caspase-dependent pathways. Int J Mol Med 25:751–759. (2003) Structures of (-)-epicatechin glucuronide identified from plasma and urine after oral ingestion of (-)-epicatechin: differences between human and rat. Free Radic Biol Med 34:840–849. (2008) French maritime pine bark extract Pycnogenol reduces thromboxane generation in blood from diabetic male rats. Biomed Pharmacother 62:168–172. (1999) Antioxidant activity and biologic properties of a procyanidin-rich extract from pine (Pinus maritima) bark, pycnogenol. Free Radic Biol Med 27:704–724. (2011) Effect of proanthocyanidin-rich extract from Pinus radiata bark on immune response of specific-pathogen-free White Leghorn chickens. Poult Sci 90:977–982. (2010) Protective effects of Pycnogenol on hyperglycemia-induced oxidative damage in the liver of type 2 diabetic rats. Chem Biol Interact 186:219–227. (2009) Pycnogenol prevents potassium dichromate K2Cr2O7-induced oxidative damage and nephrotoxicity in rats. Chem Biol Interact 181:343–350. (2008) Deficiency of adipose differentiation-related protein impairs foam cell formation and protects against atherosclerosis. Circ Res 102:1492–1501. (2009) In-vivo data on the influence of tobacco smoke and UV light on murine skin. Toxicol Ind Health 25:231–239. (2008) Improved cognitive performance after dietary supplementation with a Pinus radiata bark extract formulation. Phytother Res 22:1168–1174. (2009) Liquid chromatography tandem mass spectrometry identification of proanthocyanidins in rat plasma after oral administration of grape seed extract. Phytomedicine 16:233–243. (2002) A review of the French maritime pine bark extract (Pycnogenol), a herbal medication with a diverse clinical pharmacology. Int J Clin Pharmacol Ther 40:158–168. (2008) In vitro inhibition of Helicobacter pylori growth and adherence to gastric mucosal cells by Pycnogenol. Phytother Res 22:685–688. (2003) Effects of flavonoid extract Enzogenol® with vitamin C on protein oxidation and DNA damage in older human subjects. Nutr Res 23:1199–1210. (2011) Distribution of procyanidins and their metabolites in rat plasma and tissues after an acute intake of hazelnut extract. Food Funct 2:562–568. (2013) Distribution of procyanidins and their metabolites in rat plasma and tissues in relation to ingestion of procyanidin-enriched or procyanidin-rich cocoa creams. Eur J Nutr 52:1029–1038. (2006) Apple procyanidin oligomers absorption in rats after oral administration: analysis of procyanidins in plasma using the porter method and high-performance liquid chromatography/tandem mass spectrometry. J Agric Food Chem 54:884–892. (2006) Influence of dietary antioxidants on polyphenol intestinal absorption and metabolism in rats. J Agric Food Chem 54:3541–3546. (2004) The effect of Pycnogenol on the erythrocyte membrane fluidity. Gen Physiol Biophys 23:39–51. (2007) Carotenoids and flavonoids contribute to nutritional protection against skin damage from sunlight. Mol Biotechnol 37:26–30. (2010) In vivo bioavailability, absorption, excretion, and pharmacokinetics of [14C]procyanidin B2 in male rats. Drug Metab Dispos 38:287–291. (2013) Enzogenol for cognitive functioning in traumatic brain injury: a pilot placebo-controlled RCT. Eur J Neurol 20:1135–1144. (2005) Antimicrobial activity of Pycnogenol. Phytother Res 19:647–648. (2005) The absorption, metabolism and excretion of flavan-3-ols and procyanidins following the ingestion of a grape seed extract by rats. Br J Nutr 94:170–181. (2008) Inhibition of ADRP prevents diet-induced insulin resistance. Am J Physiol Gastrointest Liver Physiol 295:G621–G628. (2006) Ferritin oxidation and proteasomal degradation: protection by antioxidants. Free Radic Res 40:673–683. (2010) Pinus massoniana bark extract protects against oxidative damage in L-02 hepatic cells and mice. Am J Chin Med 38:909–919. (2002) Antioxidant activity of procyanidin-containing plant extracts at different pHs. Food Chem 77:155–161. (2008) Cytotoxity study of Pinus massoniana bark extract (PMBE) on human horn HaCaT (Chinese). Mod Tradit Chin Med 28:41–44. (2011) Effects of Pinus massoniana bark extract on the adhesion and migration capabilities of HeLa cells. Fitoterapia 82:1202–1205. (2012) Effect of Pinus massoniana Lamb. bark extract on lytic cycle of Epstein-Barr virus. Indian J Exp Biol 50:708–713. (2011) Direct assessment by electron spin resonance spectroscopy of the antioxidant effects of French maritime pine bark extract in the maxillofacial region of hairless mice. J Clin Biochem Nutr 49:79–86. (2006) Comparative effects of enzogenol and vitamin C supplementation versus vitamin C alone on endothelial function and biochemical markers of oxidative stress and inflammation in chronic smokers. Free Radic Res 40:85–94. (2012) Antitumor effects of Pinus massoniana bark extract in murine sarcoma S180 both in vitro and in vivo. Am J Chin Med 40:861–875. (2007) Study on anti-tumor of extract from Masson’s pine bark (Chinese). Chem Ind Forest Prod 27:16–20. (2008) Reduction of cardiovascular risk factors in subjects with type 2 diabetes by Pycnogenol supplementation. Nutr Res 28:315–320.